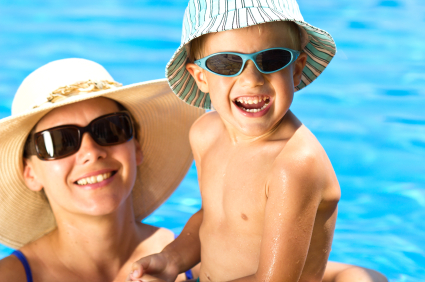 Summertime brings with it a number of potential hazards for every member of your family’s eye health. From excessive sun exposure to chemicals in swimming pools to projectiles from lawn mowers, special consideration should be given to each summer activity with regards to eye protection and eye health. Sun bathing in your back yard, boating on Lake Erie, spending the day at your county fair or experiencing the thrills of the roller coasters at Cedar Point all bring with them the potential for over exposure to the sun’s powerful ultraviolet (UV) rays. Too many UV rays can cause a variety of eye problems from burned corneas to accelerating the development of cataracts. Putting on a hat with a visor and wearing a good pair of sunglasses that block ultraviolet rays can save you from painful eye problems and distorted vision both now and in the future. Make sure every member of the family wears a hat and proper sunglasses from the youngest child to mom and dad. Mowing the lawn, trimming hedges, building a bird house or sawing wood for the camp fire all have great potential for generating projectiles that could damage someone’s eye. Before starting any of these activities, invest in a quality pair of safety goggles that are specifically made to protect your eyes during these types of projects. Sunglasses or your regular eyeglasses probably don’t provide the protection you need in these situations. Anyone who is helping or in the vicinity when these activities are being performed should be wearing safety goggles too. Swimming in a pool with too much chlorine or other chemicals can lead to red eyes, burning eyes and dry eyes. These eye conditions can all be very uncomfortable and irritating. If your eyes start to sting or hurt when swimming, simply get out of the pool and rinse your eyes with clean water. Then, don’t go back in the pool unless the chemicals have been balanced. If burning or irritation of the eyes persists for more than a few hours, you should contact your eye doctor. Summer is a great time to get caught up on eye exams for every member of the family. While at your eye exam, talk to your eye doctor about your family’s summertime activities and what he or she recommends to protect each family member’s precious vision.